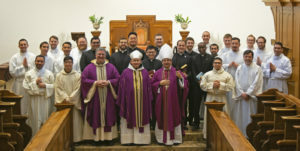 At a Mass celebrated March 8, two dozen seminarians from Mount Angel Seminary took a step forward in their journey to ordained priesthood. The Most Rev. Joseph J. Tyson, Bishop of Yakima, was the principal celebrant and instituted nine men in the ministry of lector and 16 in the ministry of acolyte. The seminarians are currently studying theology at Mount Angel and represent seven dioceses and one religious community. As instituted lectors, the seminarians are called to serve the Church as “bearers of God’s word,” proclaiming the word in the Liturgy and preparing people for the sacraments. Accordingly, they are to be especially attentive themselves to the Scriptures and meditate on it constantly so as to better witness to others our Savior, Jesus Christ. Instituted in the ministry of lector on Friday were: Anthony Hoangphan and Efrain Razo, Jr., from the Archdiocese of Portland; Sylvester Musonda Chanda and Andrew Charles Hollands, from the Archdiocese of Seattle; Michael Thomas Evert, from the Diocese of San Diego; Ian Michael Gaston and Hun Chae (Mark) Jung, from the Diocese of Orange; Oscar Saúl Medina Zermeño and James Joseph Tasy, from the Diocese of Fresno. Instituted in the ministry of acolyte were: Peter Atwood Laughlin and Luke Aaron Stager, from the Archdiocese of Portland; Sergio Armando Chávez Cabral and Tristan Peter Alec Dillon, from the Diocese of Salt Lake City; Arturo Cisneros, Oscar Saúl Medina Zermeño, Juan Carlos Reynoso Lozano, and Dalton Scott Rogers, from the Diocese of Fresno; Agustin Rajan Henderson, Darrell James Segura, Jr., and Adrian Julian Sisneros, from the Archdiocese of Santa Fe; Chad Kirwan Hill, Alexander Thomas Nelson, and Brody Robert Stewart, from the Archdiocese of Seattle; Michael John Hoolihan from the Diocese of Orange; and Br. Joseph Mary Tran, O.C.D. Since 1889, Mount Angel Seminary has educated and formed thousands of priests to serve more than 11 million Catholics in nearly 100 dioceses and religious communities around the world. As the oldest seminary in the western United States, Mount Angel is the only seminary in the West that offers a College of Liberal Arts, a Graduate School of Theology, and a Doctor of Ministry Program.